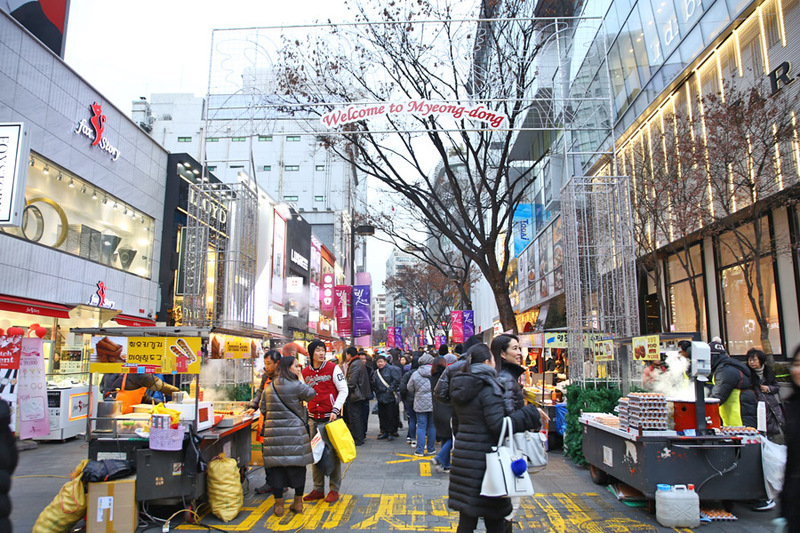 [Seoul, South Korea] Myeong-dong 명동 is one of Seoul’s busiest street, filled with shopping malls, beauty and fashion shops, and restaurants. Not forgetting the rows and rows of Korean street food – which is hard to resist when you walk through. It can get too touristy at times, but there is also because you can get really cheap facial masks and beauty products (luggage filled with paper masks, anyone?). 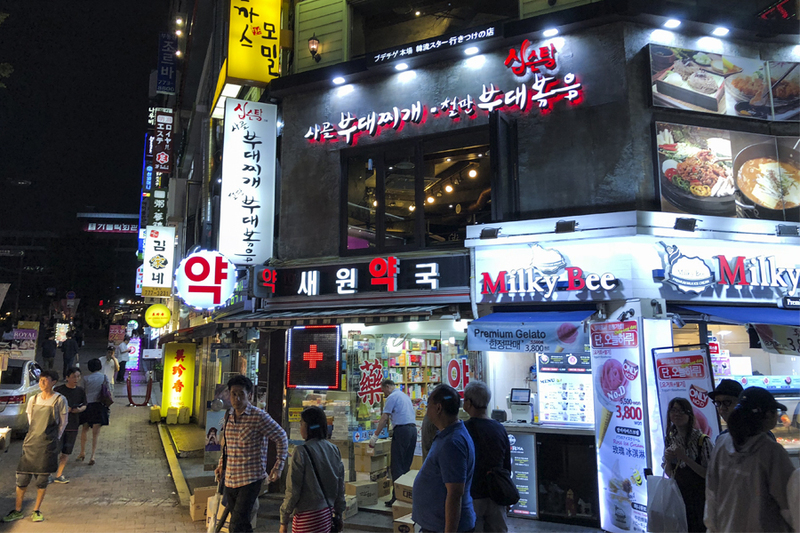 Here are some of the 10 Must-Go restaurants and cafes in Myeongdong. The good thing is, many open till late and you can still find food in the wee hours of the night. Somehow, almost every friend I know who been to Seoul has found (will find) his/her way there. 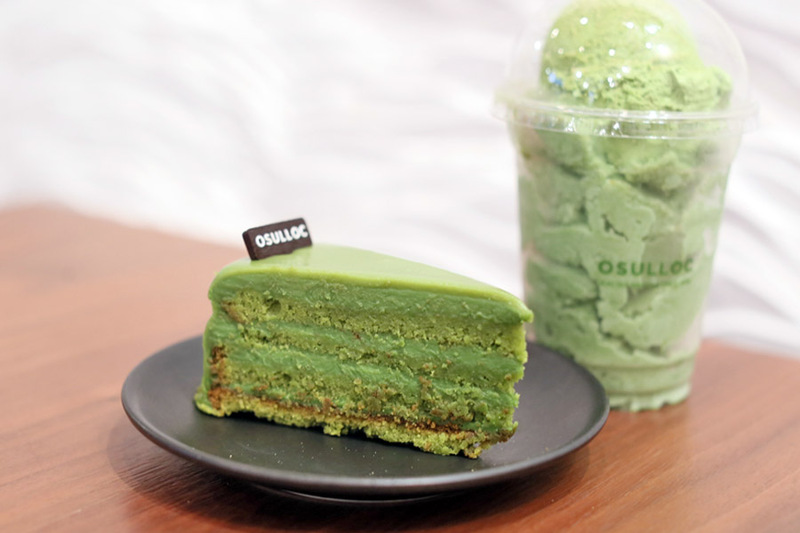 Many will use the opportunity to get the O’Sulloc Matcha Green Tea Milk Spread – I usually buy the Milk Tea boxes and green tea powder. 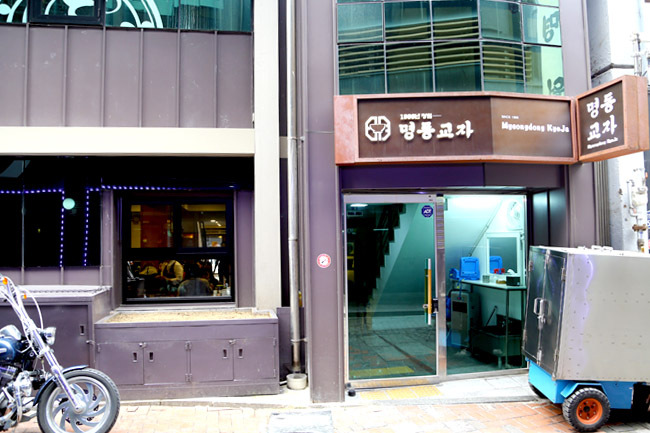 The Myeong-dong branch includes three floors which has seating areas, tea merchandise section, and even a meeting room. Level 1 feels more of a take-and-go, while Level 2 are filled with groups of friends just chilling their time away. Drinks wise, the recommended include the Osulloc Green Tea Latte (5,500 Won for Hot, 6,000 Won for Iced), Jeju Tangerine Milk Tea (7,000 Won), Green Tea O Fredo (7,000 Won), and Apple Honey Tea Latte (7,000 Won for Hot and 7,500 Won for Iced). While there are many branches all around in Seoul, this kiosk at Myeongdong with no seating space, seems to be the most popular. 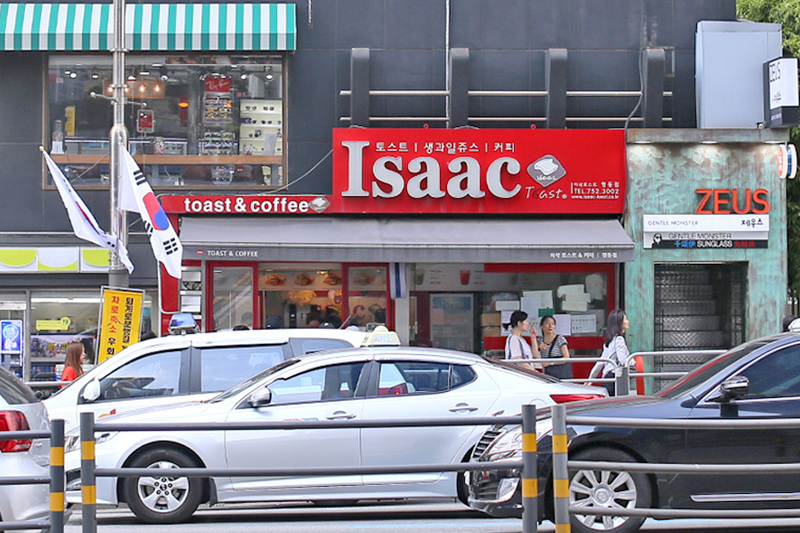 The Myeongdong outlet serves up 7 varieties of toast, including Bulgalbi (3,200 Won), Bulgogi (2,800 Won), Hot Tteokgalbi (3,200 Won), Hot Chicken (3,000 Won), Steak Ham (2,800 Won), Bacon Best (2,800 Won) and Ham Special (2,400 Won). That is between SGD$2.85 to SGD$3.80, making it a rather affordable and filling breakfast. 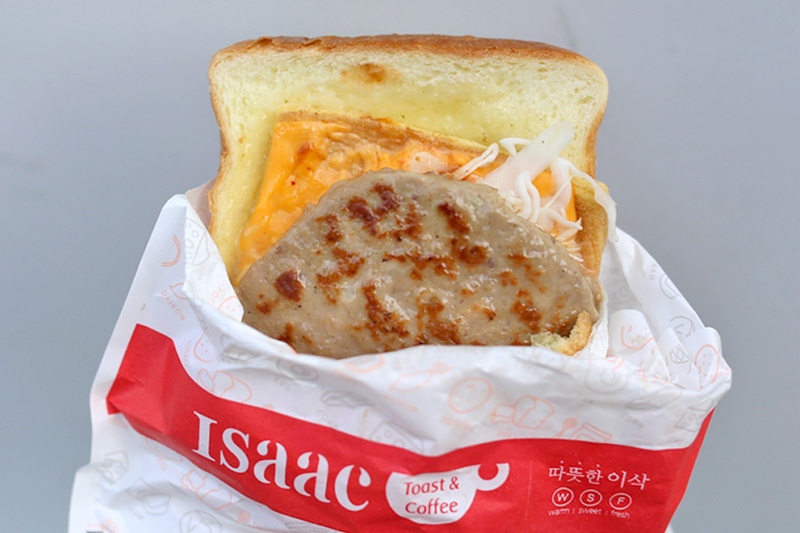 I first had a Bulgalbi Toast (3,200 Won), freshly made on the spot, filled with grilled beef patty, egg, cheese, pickles and cabbage. Upon the first bite, I realised what the hype was all about. It was simple stuff made particularly good. There was a lot going out in a toast, with some special sauce and sweet honey which gave the bread a tinge of appetising sweetness. 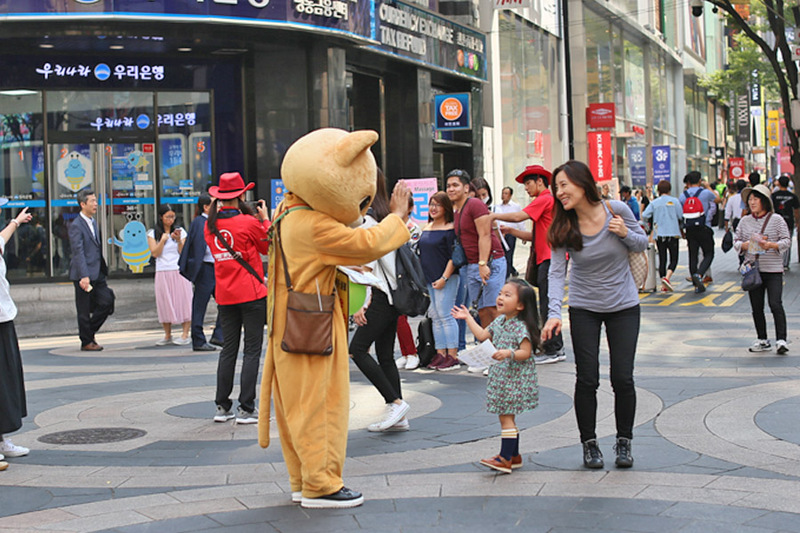 Upon exiting the station, turn left onto Myeongdong 10-gil Road. 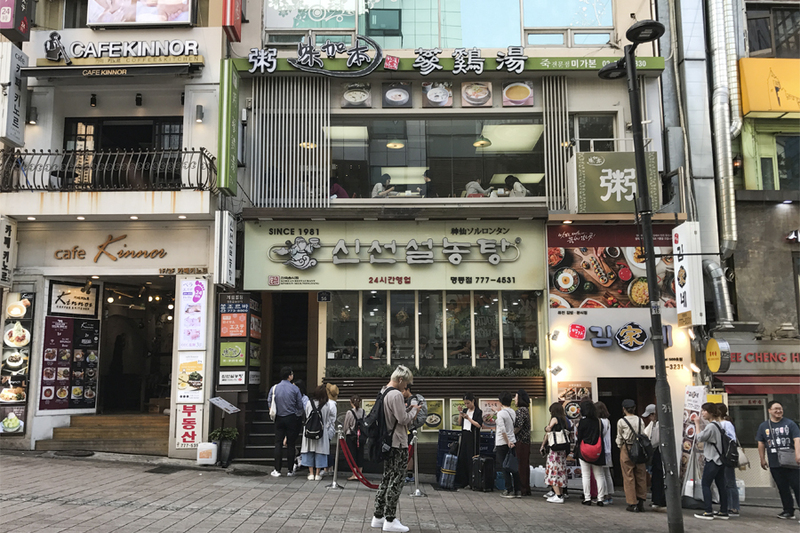 Having been around for more than 40 years, Myeongdong Kyoja claims to be the founders of handmade Kalguksu noodles, which literally means noodles made by cutting flour dough into thin slices by knife. It occupies a 3-storey shop-space, completely filled when I visited, despite having a rather lean menu. There were just 4 items on sale – Kalguksu ‘chopped noodle’ soup (8,000 Won, SGD9.60), Bibimguksu spicy noodle soup (8,000 Won, SGD9.60), Mandu dumplings (10,000 Won, SGD12), Kongguksu noodles in cold soybean soup – available during summer time. 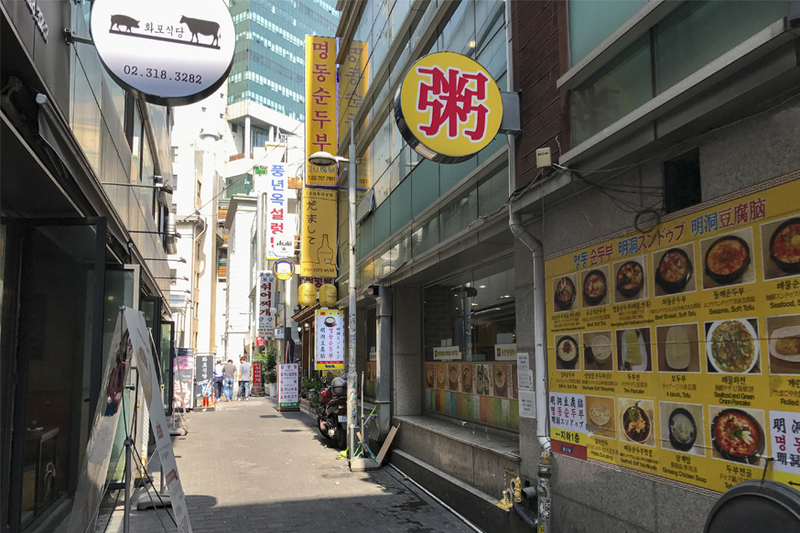 If you have walked to this stretch at Myeongdong nearer to the cathedral side, you would notice two simultaneous queues outside this block of restaurants. One to Sinseon Seolleongtang 神仙雪濃湯, the other is to MiGaBon 味加本 (미가본) upstairs. 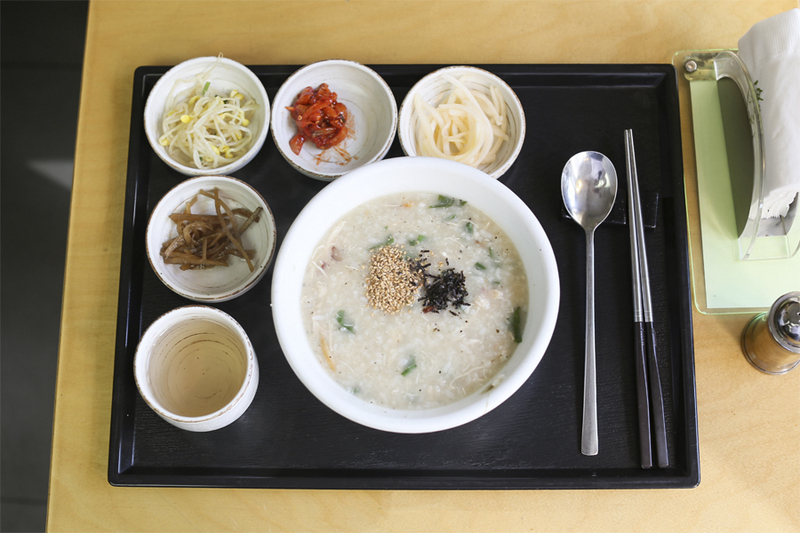 Founded in 2005, MiGaBon features Juk (죽) which is Korean porridge, along with Samgyetang (Ginseng Chicken Soup) and a selection of beverages. 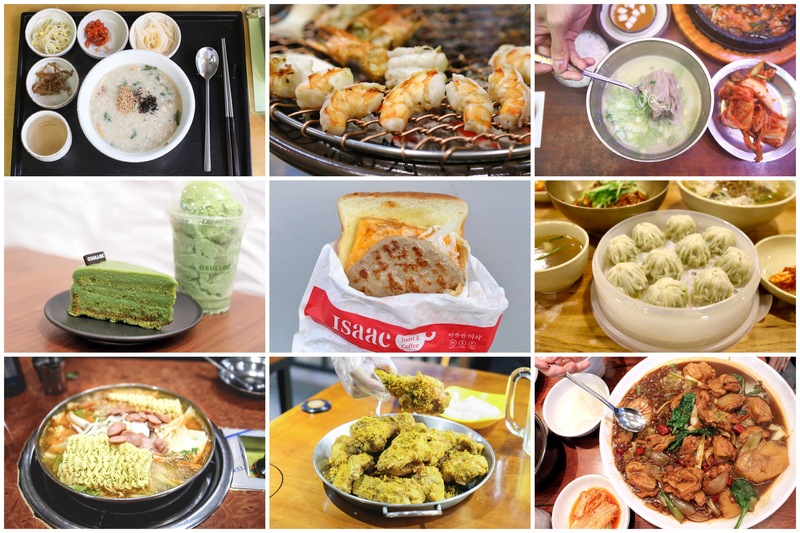 As a restaurant that specializes in Juk, MiGaBon features more than 20 kinds of porridge in its menu, from Vegetable, Mushroom, Abalone, Mushroom and Beef, Broccoli Shrimp, King Crab, Ginseng and Chicken to Aged Pollack and Bean Sprout. The popular choice was the Mushroom and Beef Porridge (8,000 Won, SGD9.59) which combined sliced shiitake mushroom with minced beef. The first spoon sent me some chills. Perhaps because I was so used to a diet of rich and robust food, having something that looked so plain and simple yet flavourful was unexpected. Sinseon Seolleongtang 神仙雪濃湯 specialises in the traditional Korean breakfast dish of ox-bone soup. Not considered common in my part of the world though, and its popularity got me intrigued enough. 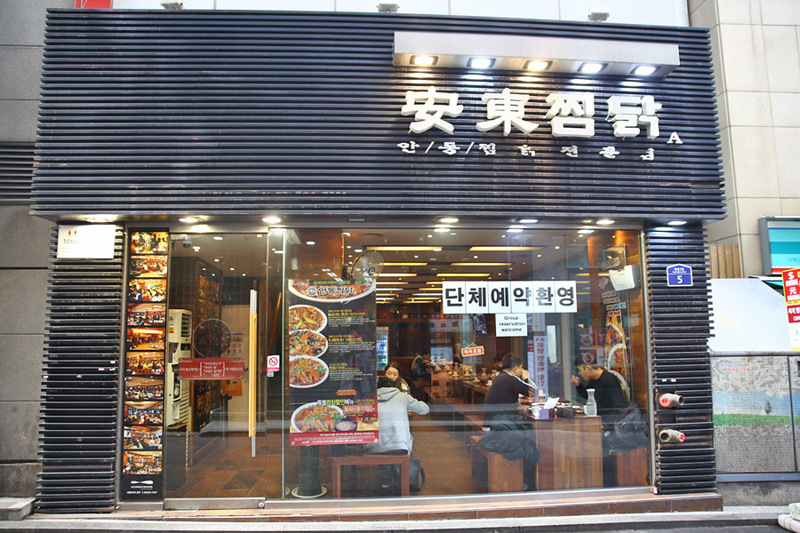 The restaurant which is in operations since 1981, is a chain with multiple locations all across Korea and this branch at Myeongdong is especially famous amongst tourists. 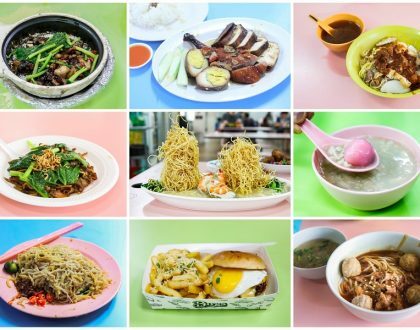 The good news for diners is, it is opened for 24 so you can head down any time of the day to satisfy your cravings. 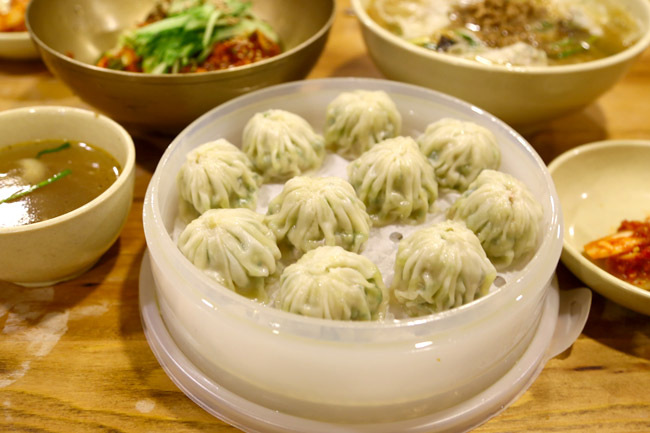 Some of the signatures include the classic Seolleongtang – ox-bone stew with boiled rice (7000 Won, 10000 Won for large), the Baekse Seolleongtang (11,000 Won) which is a premium special ox bone soup, the Mandu Seolleongtang which comes with dumplings on top of the classic base (8000 Won), Tteokguk Seolleongtang (7500 Won) which comes with Korean rice cakes on top of the classic base. 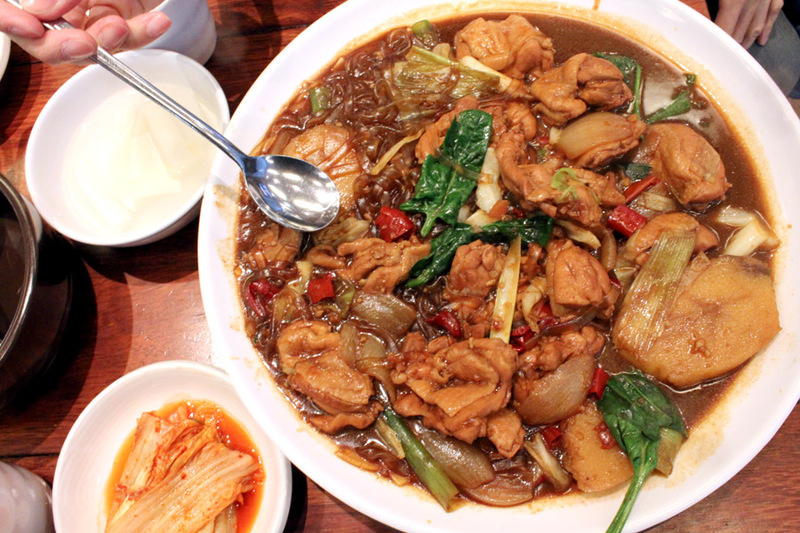 Andong Jjimdak is a famous Korean dish, known to be served in a HUGE plate with plentiful of ingredients of chicken, vegetables marinated in a ganjang Korean soy based spicy sauce. I usually need to gather 3-4 of my ‘K-Food’ friends for this, as attempting to finish one on your own is not encouraged. 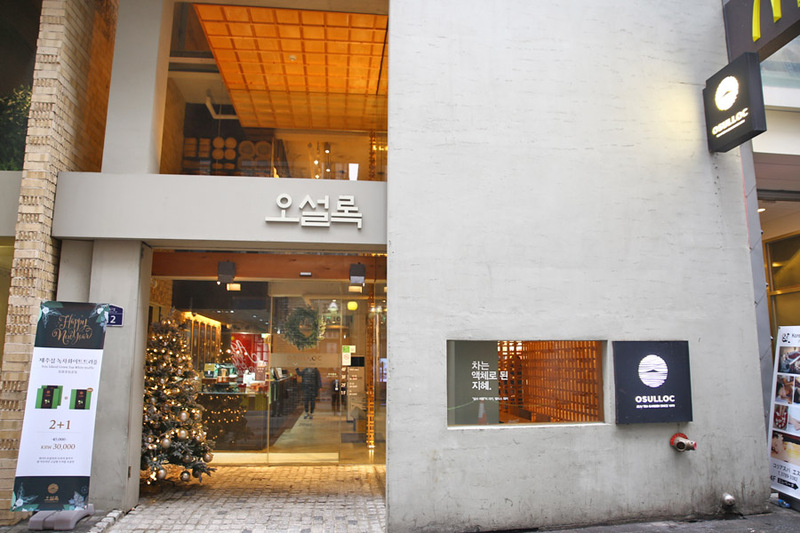 There are a couple of branches found around Myeongdong, and they keep updating their menu. You can go for their Original, Boneless Jjimdak, Seafood Jjimdak and Mayak Jjimdak. 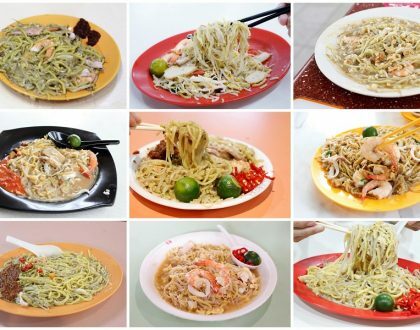 Best sharing food to have during winter times. Geumgang Bogeul Bogeul is a 3rd generation Seokkeo Jjigae restaurant with a 40-year history. 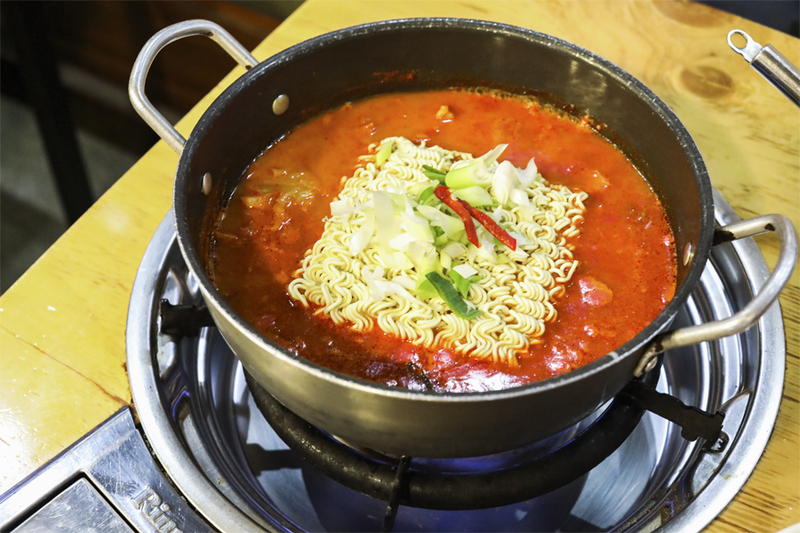 Seokkeo Jjigae is made by simmering squid and pork with a hot pepper paste-based sauce. Geumgang Bogeul Bogeul serves up a variety of stews, including Ojingeo Seokkeo Jjigae – Squid Stew (9000 Won Per Helping/Person), Osambulgogi – Cuttlefish with grilled pork belly and vegetables (10,000 Won Per Helping), and Beef Intestine Stew (12,000 Won Per Helping). I had the signature original Mixed Stew (8,000 Won Per Helping), with a pot of cuttlefish, sausage noodles, pork, udon, tofu, vegetables and ramen noodles cooked in a semi-spicy sauce. If you are looking for Army Stew aka Budae Jjigae in South Korea, especially during the colder winter months, Shimsontang 심슨탕 (or Simpson Tang) comes recommended by a couple of friends. Part of the reason is that it is co-owned by Korean singer Hwangbo, so there is that Korean celebrity effect. 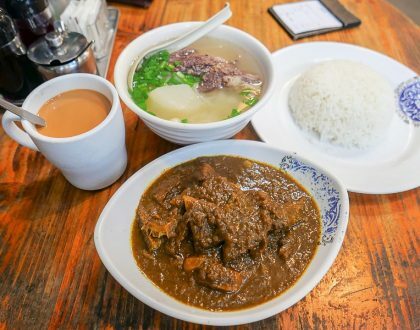 There are 5 styles served – Original Shimson Stew, Curry, Kimchi, Soft Tofu and Beef Tripe. All are priced at 8000 Won to 9000 Won per person (SGD9.70, SGD10.90), considered quite reasonable as its customer base is generally youth and students. 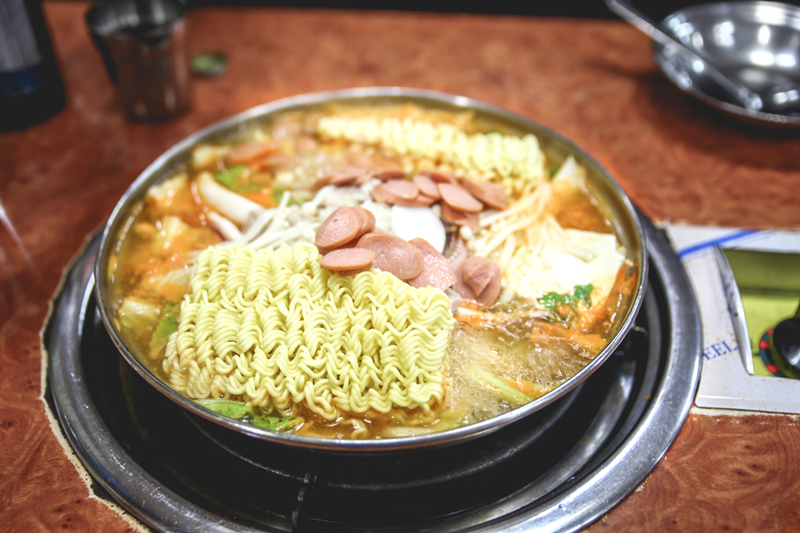 You can add on extra ramen noodles, ham, sliced noodles (they called it “chopped noodles”) or rice from 1000 to 5000 Won. 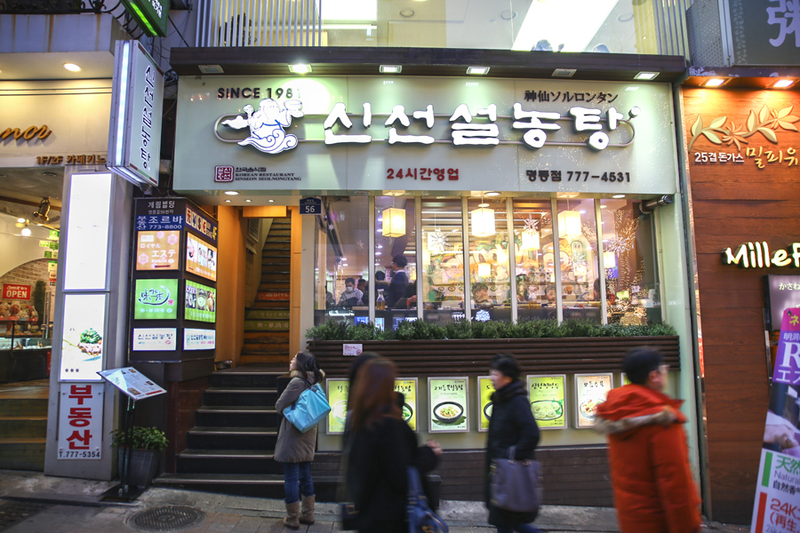 Myeongdong Sundubu 명동순두부 is known for its homemade pure tofu, made twice a day using a special machine. It offers a variety of comforting Sundubu (sometimes spelt as “Soondubu”) Jjigae – soft silky tofu cooked in a spicy stew served in a sizzling pot. You may need some form of navigation looking for this restaurant, especially when it is located at the basement. 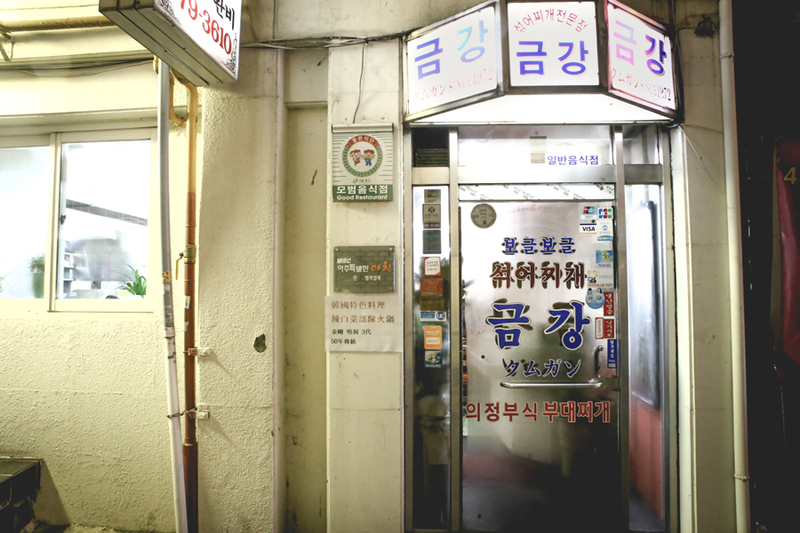 It is a few shops away from Geumgang Bogeul Bogeul, a 40-year old Squid Stew eatery. There are 7 types of Sundubu offered, from the basic Kimchi (8,000 Won), Seafood (8,000 Won), Sesame (10,000 Won), Beef Brisket (12,000 Won), Beef (15,000 Won) to the Assorted Soft Tofu Bowl with Beef Brisket, Abalone and Seafood (20,000 Won). Serving nutritious food is important, so the restaurant do not use chemical seasonings for all their soups. Instead, they use natural ingredients like vegetables and seafood to create the stock. BHC Chicken or “Better & Happier Choice” is one of most popular Korean Fried Chicken chains, having opened over 1,000 stores since 2004. 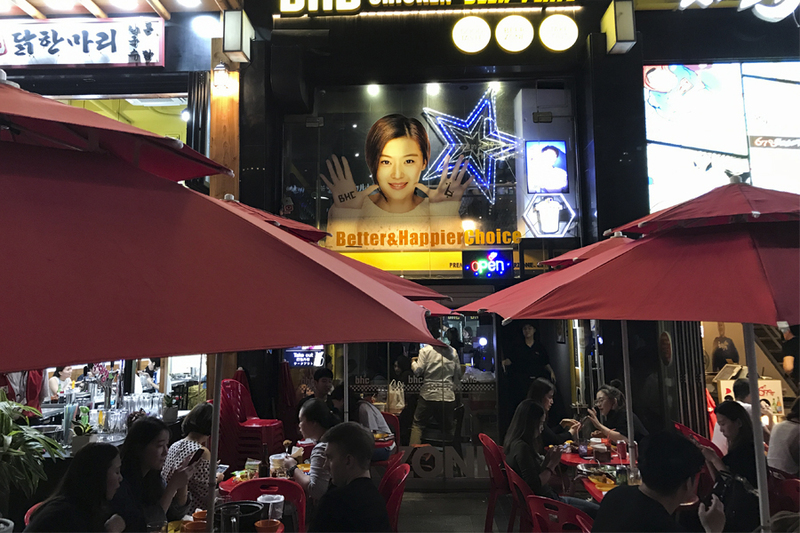 The BHC Chicken outlet in Myeongdong is a perfect spot for a late bite, as it opens up to 12 midnight. The popular BHC flavours include Sweet Garlic Soy Sauce Chicken (19,000 Won), and Boneless Sprinkle Chicken (19,000 Won) sprinkled with flavour seasoning, cheese, onion, and garlic. Other choices include Crispy Chicken (17,000 Won), Soy Sauce Chicken Leg (19,000 Won), Sauce Chicken (18,000 Won), and Spicy Sauce Chicken (18,000 Won). Surprisingly, the chicken pieces were considered above average. They came piping hot, expected with crunchy exterior and juicy meat.